We've kept our silence for quite a while now and not without reason. We have done quite some reevaluating and planning for the upcoming release. So now with all of that out of the way we are finally ready to present those plans to you, our passionate and patient fans. The most asked question, and the most interesting part first: The initial release of Yuuzhan Vong at War. This initial release will be coming Q4 2018, with an internal release date already set to the day. We're not ready to publish that date yet, but we'll keep you updated on it. Yuuzhan Vong at War will be coming to a galaxy near you this year! Countless days and nights of discussions and planning later, always with our promise of a release in mind, we can finally present the road ahead. If you do the numbers, just roughly, you'll notice that we cannot possibly have all content ready for release. That is a reality we had to face and deal with, but we are confident that we found a way to release a satisfying experience nonetheless. As made quite obvious by the release name, Yuuzhan Vong at War will be a Space Skirmish release only. This initial version of the mod will be made available through two release channels: ModDB and the Steam Workshop. We have developed two intriguing game modes that you can pick and choose from - Classic Skirmish and YVaW's unique Aftermath mode. For Classic Skirmish, we have developed an all-new sub-faction system for you to play with, that allows us to add up to 18 playable factions for skirmish battles and with the re-enabled Multiplayer mode thanks to our friends over at Petroglyph this will be quite a blast to play. This is not the final faction list, but as we near the release you'll receive several more updates on the upcoming release. The Classic Skirmish mode is intentionally kept close to the vanilla Skirmish experience to maximise compatibility and minimise the chance for disconnects caused by synchronisation issues. This means that the vanilla skirmish mode has less features than the singleplayer modes, but it will provide you with increased stability across the board. Each playable faction features a lineup similar to what the factions used in the vanilla game, with similar unit prices and battle size. Due to the aforementioned "better-safe-than-sorry" mentality we applied to this mode, most of the features, including special abilities, will be kept as Vanilla as possible. Opposed to the Vanilla skirmish mode, the Aftermath mode does not explicitly support multiplayer, but instead allows you to use all the new features and bells and whistles that YVaW has to offer. The Aftermath mode will feature our sub-faction system, but will initially release with a smaller range of factions to choose from. This list may be expanded, in the future, but currently we're focusing on these two factions. The Aftermath mode is a unique and exiting experience. You are the commander of a crippled battle cruiser that was left behind after a fleet engagement. Your job is it to not only protect the beings under your command but go even further and get your ship back up and running. Resources are scarce and limited, and you'll have to send out your transports to gather resources from debris fields and wrecked ships on the battlefield. Once you started to scour the battlefield for scraps and debris, you will make a scary discovery: It's not only your ship that was left behind. An hostile battle cruiser suffered a similar fate, and its commander is trying to repair the ship as well. "The Skirmish Battles" will have a life cycle of half a year, meaning support will end in 2019/Q2. After that we'll purely focus on "Yuuzhan Vong at War 2.0.0 - The New Jedi Order". The current plan is to release a patch on the 15th of every month, starting the month after the initial release. The "The New Jedi Order" release is the next planned release of Yuuzhan Vong at War. 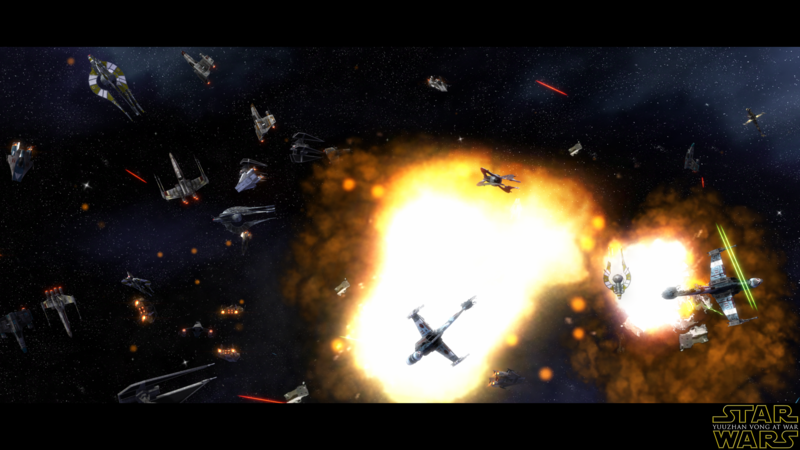 It will be the first release to feature a Galactic Conquest mode. This sadly also means that this release - opposed to the "The Skirmish Battles" release - will be a Steam exclusive release. Our Galactic Conquest mode is heavily scripted and features additions and changes that need the enhanced capabilities and stability of the Steam version, specially the Savegame Corruption fix. Unless Disney decides to give Petroglyph the additional resources to patch up the Disk/gog.com versions, this is the only way for us to make sure that you experience a stable game. Stay tuned for future updates here on ModDB or join our Discord server to get more updates, sneak peaks and get in touch with the team. As always, a great many thanks to all of our fans, who are supporting us and have shown an incredible patience with us, but now, you won't have to wait that much longer. Thanks to all the tireless people behind the scenes, who are either part of the team, but keep quiet in public, or are helping us out whenever we need them: You guys rock! So, yet again: "That's all folks!"